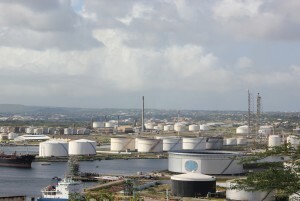 WILLEMSTAD - All the focus is now on the Curaçao Refinery Utilities (CRU) for the problems with the refinery. But according to the STK union, CRU is not the problem. The problem is the Venezuelan State Oil Company PDVSA. CRU is responsible for the supply of electricity, steam, water and air pressure for the Isla refinery which is leased and operated by PdVSA. According to Chairman Adriëla Job-Dirksz, of the STK union, CRU has its problems, but those problems are caused by the very inferior quality of asphalt provided by Isla / PdVSA and which affects the refinery’s boilers. She repeats what director Roderick van Kwartel of the public company Refineria di Kòrsou (RdK), 'landlord' of PdVSA and responsible for CRU, said on Sunday: namely that CRU is suffering considerable damage to a boiler and pipelines as a result of the very poor asphalt that serves as fuel for the plant. The repair work is much larger and therefore takes a lot longer than usual.